This 1746 map of Khwarezm shows Konye Urgench, then identified as "Urjenz", circled, at time when it still played a prominent cultural and commercial role in the region. From the south, one must cross the desert of Kara Kum, or Black Sand; from the east, it is the Kyzyl Kum, or Red Sand; and from the west, the route transits the desiccated Usturt Plateau as it tilts off the Caspian Sea’s shoreline. From the southeast, down the river Amu Darya, known in antiquity as the Oxus and to the Arabs as the Jayhoun, the journey requires 2,500 twisting kilometers from its source in the Pamir Mountains hard against the border of China. Once the capital of the Khwarezm Empire in the 10th century ce, today Konye Urgench is a small town in northern Turkmenistan, minutes from the border with Uzbekistan, whose past is memorialized by relic structures, such as the Qutlug Timur Minaret, built in the 14th century, and the early-13th-century Terkesh Mausoleum, which both appear in this photo taken in the late 1920s or early 1930s by a Russian army officer. The Khwarezm oasis on the lower Amu Darya—known also as Khwarezmia and, to students of Herodotus, as Choresmia—lies split between Turkmenistan and Uzbekistan, both of which gained independence a quarter of a century ago. Their border is not an easy one to cross these days, and the once-grand city of Konye Urgench, the capital of Khwarezm and seat of power of the Khwarezm Shahs, who, in the late 11th century, nearly conquered Baghdad, lies on the Turkmenistan side—the less easy of the two. Despite the apparent hardship in reaching the oasis from any direction, Ross Dunn, biographer of the world traveler Ibn Battuta, who passed through Konye Urgench in the winter of 1334, concludes it was a journey that could nevertheless unfold as smoothly as a long voyage by sail on the trade winds of the Arabian Sea. Dunn called the routes toward Khwarezm "a complex crossroads of trails connecting all the major agrarian regions of the hemisphere"—in other words, the Silk Roads. From the Old Persian word meaning “valley of wolves,” early Arabs called the place Jurjan and Jurjaniya; Chinese called it Yuye-Gan, and it was later Turks and Mongols who named it Urgench. 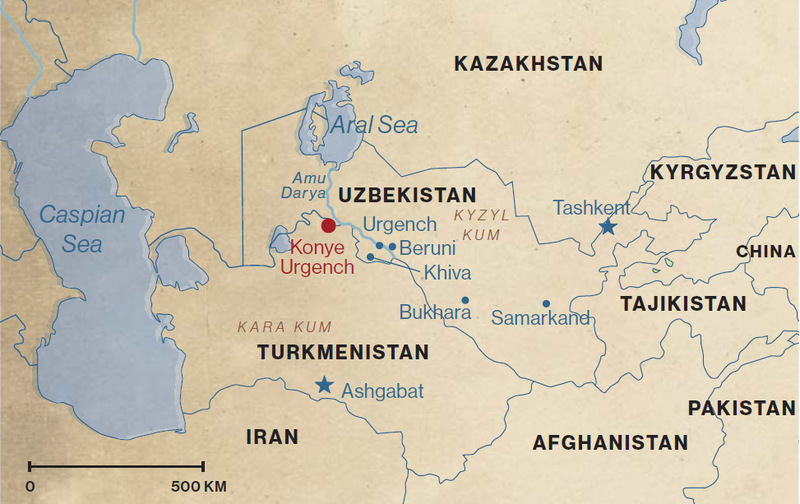 Its current name, Konye Urgench, is Persian for “Old Urgench,” and this differentiates it from modern Urgench over the border in Uzbekistan. This has left Konye Urgench a ghost town of sorts, an uninhabited archeological park replete with memories, ruins and more than a handful of little-known monuments. The 13th-century Persian historian Ala al-Din al-Juvayni wrote that even after the Mongol conquest in 1221—the second-most devastating attack the city endured—Konye Urgench remained "the throne of the Sultans of the world and dwelling place of the celebrities of mankind; its corners supported the shoulders of the great men of the age and its environs were the receptacles for the rarities of the time." "The Throne of the Sultans of the world and dwelling place of the celebrities of mankind." 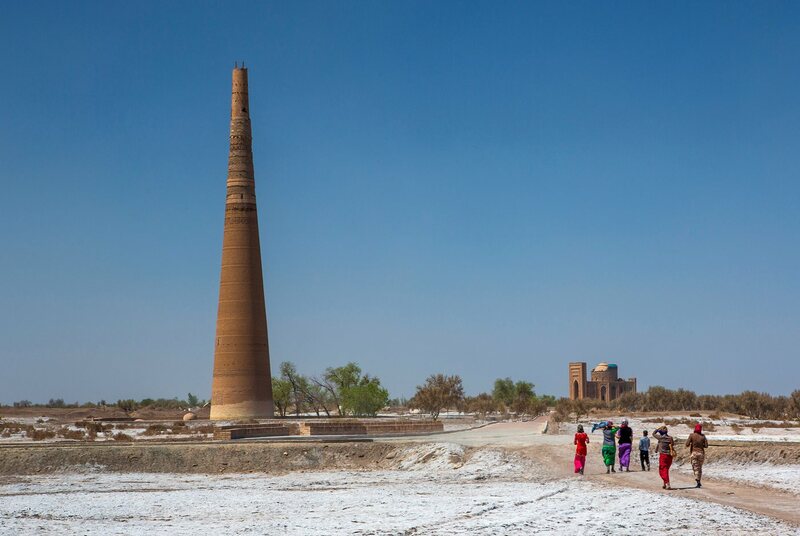 Among its most visible structures standing today is the finely tapered minaret that rises 60 meters, completed in the 14th century under Qutlug Timur, a regional khan (governor) of the Golden Horde. 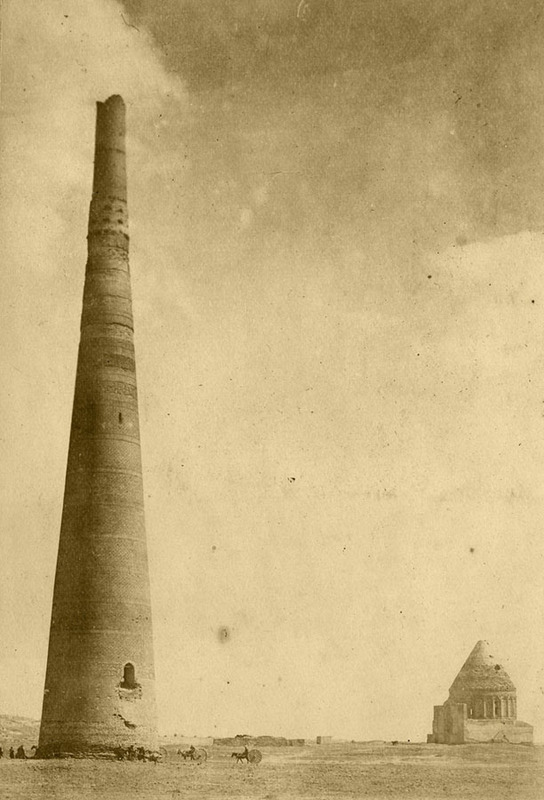 Commissioned more than two centuries earlier, this is the tallest minaret of medieval Central Asia, second only to that of Jam in Afghanistan. Built of raw terra-cotta blocks and decorated with friezes of angular Kufic calligraphy shaped from the same austere, monochromatic brickwork, it compares favorably to the Kalta Minor minaret in nearby Khiva, an unfinished stump in modern glazes that aspired to a height of 90 meters but achieved only 26 due to the death of its patron six centuries after Qutlug Timur heard a muezzin’s call to prayer in Konye Urgench. 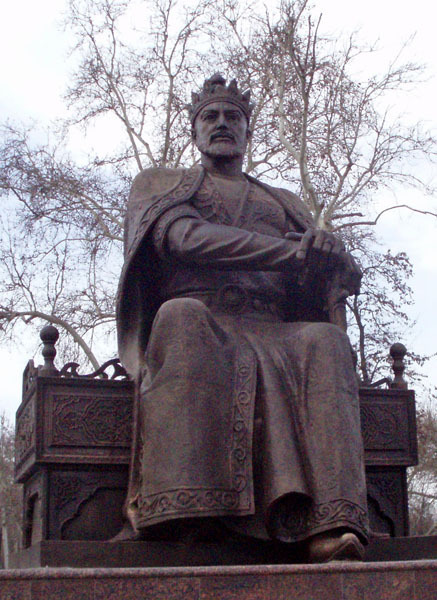 A statue of Timur, or Amir Timur, sits in central Samarkand, Uzbekistan. Timur built up a formidable army and an empire that encompassed much of Khwarezm, including Konye Urgench, where several revolts provoked him to level the city in 1388—a devastation from which it never fully recovered. Just south of the main cluster of relics that historicize the city flows the Amu Darya, the river that has shifted its course over the years, leaving Konye Urgench alone to its memories. 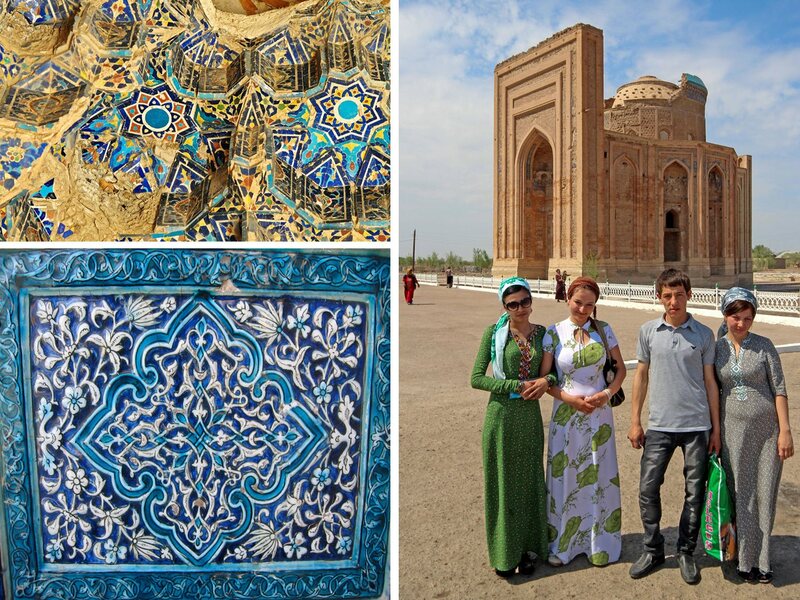 Tourists looking elsewhere at Central Asian Islamic architecture might be more impressed with heavily restored facades and Soviet-planned infrastructure in Bukhara and Samarkand. It is Konye Urgench’s very desolation, caused largely by the sweeping raids of Mongols and Timurids, but also by years of Soviet neglect fueled by Russian nostalgia for Khwarezm’s later capital at Khiva, that evokes its frozen-in-time, never-to-be-touched-again quality. Visitors to monuments at Konye Urgench head toward the Qutlug Timur Minaret and the adjacent site honoring his wife, Tura Beg Khanum. 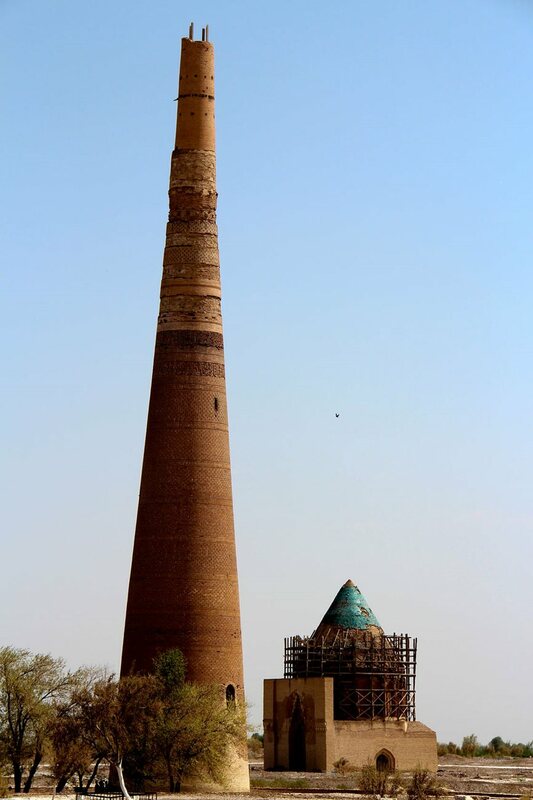 Another minaret is known only by its dedicatory inscription on a lead plaque found among the city’s broken remains, showing that it was built at the height of the city's architectural flowering during the second line of the Khwarezm-Shah dynasty. "The emir, the sayyid, the just prince"—and here is given his full and elaborate name—"ordered the construction of this minaret … in humility toward religion and to approach God, may His mention be great, with a desire for recompense in this world and the hereafter." 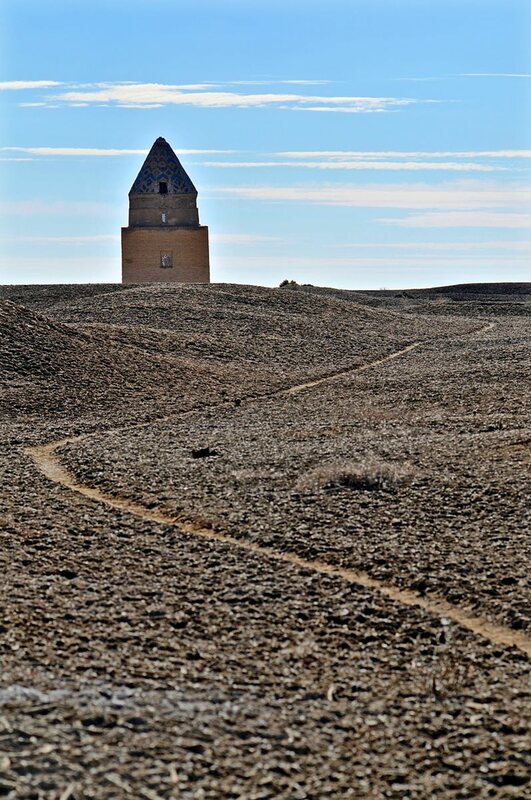 The minaret is thought to have been reduced to rubble by the Mongols not long after it was built. The plaque is now in the Tashkent Museum, 800 kilometers and another country away. In correlating Konye Urgench’s surviving monuments to its known history, the one dynastic founder who stands above all others is Anush Tegin Gharchai. He became the slave of a late 11th-century master, under whom he served a Seljuk sultan before becoming the official keeper of the royal washbasins. Though this was inauspicious as a start, he founded a family line that culminated with his great-great-grandson Ala al-Din Muhammad, who, prior to his death at Mongol hands in 1220, threatened Baghdad, forced his name’s invocation during Friday prayer just after that of the Abbasid Caliph and expanded the Khwarezm-Shah empire nearly from the Tigris to the Indus. The Encyclopedia of Islam calls Konye Urgench in this time “the center of the most powerful military empire of the Islamic East”—if only for a matter of years. The political history of the greater Khwarezm region is a hodgepodge of names, both pre-Islamic and Islamic, and their various founders, governors, invaders and usurpers—among them nomadic groups, like Scythians, Göktürks, Oguz and Seljuks, and successive dynasties, most famously Achaemenids, Afrigids, Sassanids, Samanids, Umayyads, Ghaznavids, Chagatayids, Batu’ids, Timurid Gurkanis, Arabshahids and Uzbeks, all the way up to the distant Muscovite family Romanov—some more obscure than the next, but all with parts to play in its past. There was something about Khwarezm that attracted everyone from scholars to the merely curious. According to one Muslim chronicle, the oasis was founded a millennium before Alexander the Great’s conquests by Kai Khusrau, a legendary figure from the Persian epic the Sayvash, written in the Zoroastrian liturgical language Avestan and later immortalized in Firdawsi’s 10th-century epic poem Shah-nama. That Kai Khusrau’s grandmother was alleged by late medieval historians to be a Turkic princess is fitting, for over the centuries Khwarezm gradually de-Persianized and increasingly Turkified—to the point that the Persian language was lost and a Turkic tongue became the written and spoken lingua franca. One of the earliest recorded mentions of Khwarezm dates to the Old Persian Behistun Inscriptions, a rock relief inscribed by Darius the Great in the fifth century bce that lists the oasis as one of 23 countries under the king’s domain. The Greek historian Herodotus nearly half a century later wrote that Khwarezm was the Achaemenid Empire’s 16th province and that Xerxes relied on its troops for his invasion of Greece in 480 bce. Alexander’s chronicler Arrian wrote that Pharasmanes, King of the Khwarezmians, offered 1,500 cavalrymen to help the Greeks defeat the Amazon Queen. It is doubtful, however, that Alexander himself ever visited Khwarezm, for how, in an address to his own troops, could he have referred to such a verdant oasis as "the Choresmian waste"? Right: At the Tura Beg Khanum memorial in Konye Urgench details the inside of the smaller of its two domes, left top, illuminate the artistic expertise that blossomed between the Mongol conquest and Timur’s destruction. Lower left, at the memorial for Najm al-Din al-Kubra, a detail of a floral arabesque is glazed in shades of celestial blue. Konye Urgench, renowned for its crafsmanship and architecture, was often a source for design and workmanship for other parts of the Khwarezm oasis region. 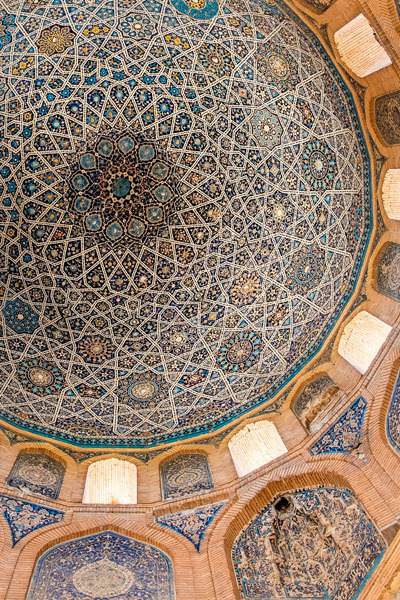 Rosettes, strapwork and 10-point stars create a “kaleidoscopic vault of heaven with shimmering scattered jewels and luminary bodies,” wrote art historian Sara Kuehn of the main dome of Tura Beg Khanum, where tile glazes include cobalt blue, celadon green, amber, saffron and red cinnabar with gold leaf highlights. There was something about Khwarezm that attracted everyone from scholars to the merely curious. The early 11th-century polymath Ibn Sina, a native of a nearby Bukharan village, taught there briefly before heading west. A century earlier, Ibn Fadlan of Baghdad passed through on his way north to the Volga, as did Ibn Battuta of Tangier on his way east to India. 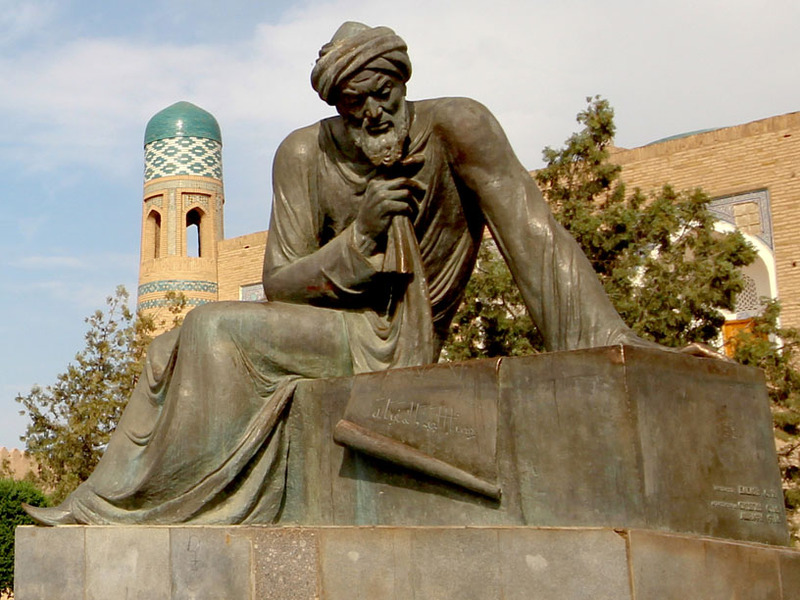 The mathematician Muhammad ibn Musa al-Khwarizmi, who taught at Baghdad’s Bayt al-Hikma (House of Wisdom) in the ninth century and whose coordinates of the known world’s cities and places much improved Ptolemy’s map, was only the first of its great native sons. Anyone today who marvels or curses at the power of a computer can give him a nod, as his name, in a variant spelling, is invoked by software engineers whenever they code the latest algorithms. Another Khwarezmian savant was Muhammad ibn Ahmad al-Biruni, the 10th-century geographer and famous India traveler who, 1,000 years after his birth, was honored by the Soviets with the name of a city they built on the site of the oasis’s first capital of Kath, a 200-kilometer trek southeast from Konye Urgench. Biruni comes from the Persian word meaning “outer,”and far more recently nasa scientists gave his name to a crater on the moon—perhaps fittingly on the far side. Called by historian C. E. Bosworth “a Khwarezmian patriot clearly concerned with the ancient glories of his homeland,” al-Biruni wrote Chronicle of Khwarezm, now lost except for a brief extract that appears in another geographer’s work; however, his extant Chronicle of Ancient Nations tells how the world’s peoples—Persians, Magians, Greeks and Khwarezmians included—divided their calendar years into months, festivals and signs of the zodiac. The Khwarezmians, he wrote, had a month they called Harudadh, which fell at the start of the hot season, and its first day they named, “when topcoats shall be discarded.” The 10th day of the month of Ispandarmaji was the feast of Wakhsh Angam, the name of the guardian angel of the Oxus, showing that Khwarezm, just like all early riverine civilizations, prayed for optimal floods—not too great, not too small. A panoramic view of Khiva, Uzbekistan, shows some of the architectural influence of its once-rival city—Konye Urgench. The water that serveth all that country is drawn by ditches out of the River Oxus, unto the destruction of that said river, for which cause it to falleth not into the Caspian Sea as it hath done in times past, and in short time all that lande is like to be destroyed and to become a wilderness for want of water when the Oxus shall faileth. 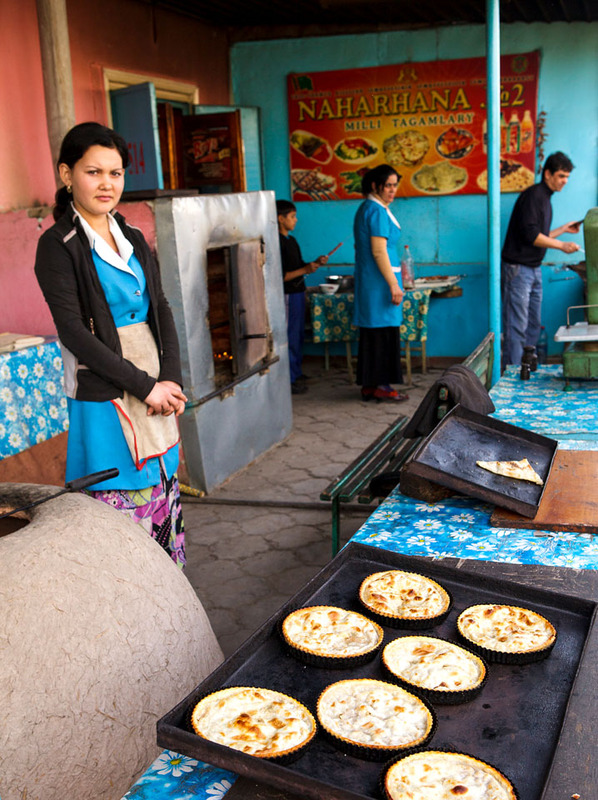 A café in the heart of Konye Urgench, demonstrates the continued popularity of floral motifs and turquoise blue—as well as fresh flatbread. The mistaken belief that the Amu Darya emptied into the Caspian Sea was inspired by the occasions it overflowed into the vast Sarykamysh Depression, south of the Aral Sea near the river’s current final bend to the north, and then drained west. This misunderstanding inspired Russian Tsar Peter the Great’s first foray into Central Asia, when shortly after 1715 he sent his Circassian-born general Alexander Bekovitch-Cherkassky in search of what was thought to be the river’s original mouth. The tsar’s goal was to redirect its flow, thereby creating a military waterway all the way down the Volga, across the Caspian and up the Amu Darya—all to get closer to British India. When Bekovitch was killed by the Khan of Khiva nearly two years later, Russia became set on subduing Khwarezm, and the imperial task took another century and a half. Al-Biruni was one of the last to be fluent in the Khwarez-mian tongue, a member of the early Eastern Iranian language family. He wrote that during the Arab conquest in 712 ce by Umayyad commander Qutaiba ibn Muslim, the sages who knew it had been driven away. “In consequence, these things are involved in so much obscurity that it is impossible to obtain an accurate knowledge of the country,” he wrote. The 12th- century Arab geographer Yaqut al- Hamawi lived in the oasis in 1220, a year before the Mongol invasion, and he described its cultural apogee in his Mu’jam al-Buldan (Dictionary of Countries). “There is hardly a town in the world comparable to the capital of Khwarezm,” he wrote, “for its riches and metropolitan grandeur … all the while there is general security and undisturbed peace”—famously ironic words before the city was flooded, looted and burned just one year later. Turkmenistan has mounted efforts to restore Konye Urgench's aging structures since independence in 1991, and the old city was named a unesco World Heritage site in 2005. Its people excel those of Samarkand in magnificence and elegance, being devoted to poetry and human learning, all admirable in the fine arts … indeed, it is commonly said of them that their children in the cradle when they cry Ah! do it in harmony. This was all to end in the year 1388. For the third time in 15 years, Khwarezm revolted against Timur’s rule and the tributes he demanded. His patience at its end, Timur wrecked the irrigation system and leveled most of the city. As Ibn Arabshah described: “Tightening the belt of resolution, Timur invaded … and to the beautiful virgin city he sent in a suitor and besieged her and reduced her to the utmost distress.” Fifteen years later, the Spanish ambassador Ruy González de Clavijo did not even bother to enter the devastated city while passing nearby en route to Timur’s court in Samarkand. Konye Urgench’s light dimmed further still in the 17th century when the Arabshahid dynasty founded a new town of Urgench 30 kilometers northeast at Khiva, which quickly grew into a commercial center. With the rerouted Amu Darya now running north, the upstart settlement was called Toza Urgench (Fresh Urgench) or Yangi Urgench (New Urgench) by locals, and the former capital became Konye (Old). New Urgench’s prosperity did not go unnoticed, and it attracted Ural Cossack raiders from north of the Caspian in the 18th century, Russian imperial conquest in the 19th and finally in the last century the severe urban renewal of the Soviets. Konye Urgench meanwhile lay undisturbed, quietly forgotten. Despite today being called a “fascinating ramshackle wilderness” by independent researchers David and Sue Richardson, and although some domes and minarets have completely collapsed in more recent years, partial restoration has saved others from further damage, and some of the monuments of Konye Urgench have received repairs. What Anthony Jenkinson wrote not long after Timur’s devastation, that all its buildings were “ruined and out of good order,” has not led to utter neglect 500 years later. As unesco reported in 2005 when naming Konye Urgench a World Heritage Site, the ruined city offers greater historical integrity and authenticity than most other Central Asian cities precisely because it was abandoned for the last three centuries. That barely 3,000 foreigners visited the site last year means that, as it is no longer the “rendez-vous of the most distinguished figures of the world,” this is likely to remain true for years to come.